We were busy for last few days, so could not post anything here. One of our readers requested for this recipe. This is a recipe from my mother’s sister. She was a very good cook. She passed away about 3 decades ago. I had noted down few of her recipes. This is one of them. Everytime I cook these dishes, I remember her. Capsicum (phugge mirsangi) is cooked in a sweet and spicy coconut paste to make kairas. This can be made only with capsicum or a mixture of potatoes and capsicum. Jaggery is an optional ingredient, so I do not include it when I cook this dish. This is my husband’s one of favorite side dishes. Click here for another version of kairas. Heat oil and add mustard seeds. Add curry leaves. Fry capsicum, potatoes, turmeric in the seasoning for few minutes. Add a little water and cook. Heat oil and add chana dal, green chillies, sesame seeds, 1/2 tea spn mustard seeds, asafoetida. Add coconut and fry for a minute. Grind to a paste (do not add too much water). Add this to the capsicum-potato mixture with salt, jaggery, tamarind. Cook till done. Varadpachi, never heard or eaten this dish. What does Kairas mean? Looks interesting with sesame seeds, channa dal. Will surely give it a try. Shilpa: Aruna, probably the name has come from kai – coconut in kannada. Kairas- coconut masala. Vardpacchi….tried this a couple of times and is liked by all at home. Came searching for this recipe again today and thought of posting this comment. Thanks once again. Wow, I like this a lot. Haven’t had it with jaggery though, we make more like Sasam. The phugge mirsaang and batato gel really good in this. I love capsicum! amma makes this dish just fab! I’ve never tried it though. My husband loves potatoes…thanks for reminding me of this long forgotten dish. Will make it very soon. 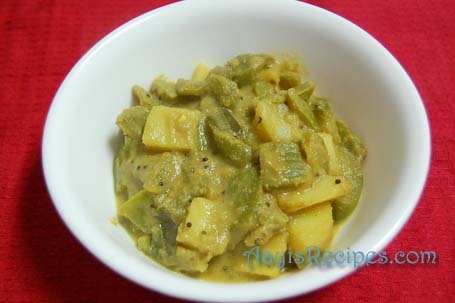 Love your receipe, it has a authentic taste of managalore. Just like your daughter u take us for a ride to our native place. wow… i totally forgot about this dish. My mom uses chana(black) instead of chanadal..
i know it tastes heavenly with the small capsicum.. (spicy ones).. Thanks for posting and reminding such a wonderful dish. Varada pacchey…all ingr. n end product looks so tasty..shall surely try it..loved the name, KAIRAS..it feels like hearing aamras to me..something which we love to devour! Coming from an ancient person, it surely has antique recipe value!! Thanks for sharing ! I have had benDekai kairasa but never had capsicum one. and the ingredients used are bit different to what u have posted here. I have tried making benDekai kairasa at home but it’s tastes whole different from what my amma makes as she uses the special native variety of okras. I remember tasting this dish at a relatives place.I loved it and now i have a trusted recipe to try it out. Never heard of this dish before. Looks yummy and tempting..Will try making this dish.. This is a very cool recipe. Nice picture with lovely color. YUM! this is one of my fav dishes too. My mom adds kaju(cashews) to this well. Oh how yum it is to have this with warm chapatis!!! How are you? Sorry for not visiting regularly. Nice recipe.. Very informative,Hey, great post. Really great tips for beginners,Thanks…Very informative website with important details. your recipe looks good.you know what i dont know kannada ,so i am curious to know what is the meaning of kairas. Shilpa..chinchamb kedana ghalche..lastantu bahusha meet ghaltana nave..i m making it right away! Tks for this lovely recipe! I like reading your site from time to time, it reminds me of all the food that my grandma used to cook…especially when I read the Kairas recipe, it made me think of her. Reading all the recipes which I used to eat with relish in my childhood is very comforting, like being in her kitchen. Brings back fond memories. Shilpa..this was TOOO GOOD! MY KIDS TOO HAD IT, who run miles away from veggies! YAY! I m totally excited on having tried this n nothing was left ! THANKYOU! (I got hung with both ur kairas recipes..followed Varada pachis way, just replaced green with red chilies as per ur last post..) Hey my mhave used to make vaygana sagle and this masolu reminded me of that..so next time wd use same recipe on vaygana..wd b gr8 naa if kiddos too have it! 🙂 HUGS N THANKYOU! I am so glad to see this recipe here…I have always been fond of Kairas and it was one of the first few recipes I had jotted down from my Mom. She uses boiled peanuts in this, although not always…but I remember loving the taste of boiled peanuts, especially with the jaggery as well.. Thank you for posting this recipe..brought back such good memories..
Love your recipes. Could you please post a recipe for Dharwad Peda if you know it. Thanks. I made it last week, i loved the taste of this kairas. Channa dal and sesame seeds indeed give a lovely aroma to this dish. Thanks you. this will be regular at home. Love the combination of capsicum-potato-coconut. Kairas looks yummy. My mom makes slightly different way. Will try your method sometime. Thanks for the Recipe. I substituted Splenda instead of Jaggery and still it was awesome. Hi Shilpa, this one too of the many dishes I tried frm ur website turned out very tasty! thanks to u 🙂 I’m looking fwd to preparing some of ur recipes when I visit India. The mango kairas is made with raw mango…is boiled with enough water and rest of the procedure is same.. will make a mango kairas…………. I came across your blog a few days back and quite like the recipes and the presentation. Thank you and keep up the good work! Capsicum kairas is one of my favourite konkani recipes. I had almost forgotten about this recipe since the time we moved from India…thanks for reminding me! I am going to try your verion. But I have a slightly different version of karias (from my mother). It does not have channa dal, green chillies and curry leaves. This version has ‘methi’ seeds (fenugreek). You add this in the ‘phodni’ that goes before cooking the capsicum and potato. Also, the tamarind paste is added to this ‘phodni’ and not towards the end. It tastes absolutely delicious. Another tip: The last time i made kairas, I used dessicated coconut as I could not find fresh/frozen coconut. Although there is no perfect substitute for fresh coconut, the dish tasted quite good with dessicated coconut. Also, i do not like potato, so i just make the dish with capsicum. I tried ur dish and it was awesome! i never knew that capsicum wud taste good in a gravy! Thanks shilpa! Shilpa, I simply loved the taste profile of capsicum in this recipe. Had an amazing dinner today with the methi daal recipe from your site. Thanks a lot for all the effort in posting such wonderful dishes!